Plays on your unattempted mission. Nullified if you begin an attempt with <3 (or > 7) personnel, or if you play (or have played) Scan or Full Planet Scan. If you solve, score points; opponent loses points (discard event). Point-Box on card: +10/-10 bonus points (you score points, when you play or use this card). Characteristics: Rule, bonus points, -icon. This event is nullified if you play or have played Scan or Full Planet Scan on any mission, or if you begin an attempt of the mission on which it is played with <3 or >7 personnel. Attempts of other missions have no effect on this event. There are 14 entries for 62nd Rule of Acquisition (ST1E 9 C 16) at the Tradeplace (44 haves and 0 wants). 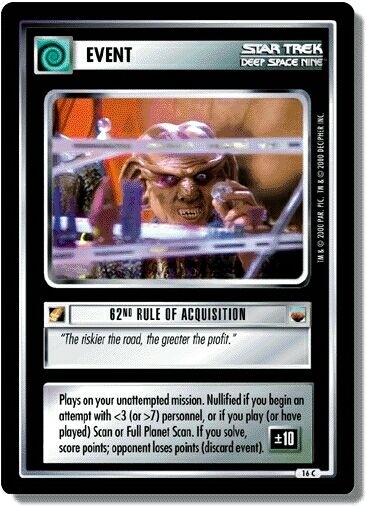 Click here to see all trade list entries for this Common card!